In a recent report from ComReg, it has been revealed that Virgin Media has the lowest number of complaints per customer compared to all other fixed operators. 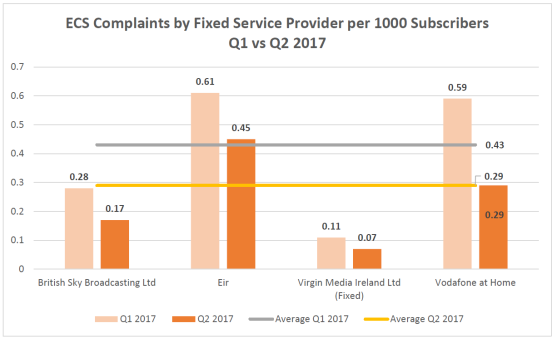 Virgin Media has welcomed the recent publication of the ComReg Consumer Line Statistics Report (Q2 2017) which shows that Virgin Media has the lowest number of complaints per customer compared to all other fixed operators. Virgin Media Vice President of Customer Michael McCarthy said: “Through our dedicated national customer experience centre in Limerick, we’re providing the most user friendly services for Customers connecting to Ireland’s fastest broadband and connected entertainment service. This is the second instance this year where Virgin Media has come out on top for customer service. Earlier this year, Virgin Media was named Ireland’s fastest broadband network by consumers through the independent network assessment firm Ookla. Also in 2017, Virgin Media won the awards for Best Broadband Bundle, Best Broadband Only Deal and Best TV Deal at the inaugural bonkers.ie awards. Like the sound of Virgin Media? Why not compare all deals from the provider across broadband, phone and TV?